A till is a cash drawer assigned to an employee during their shift to take payments. You can track various flows of money through your business through Revel's extensive reporting and tracking. These functions include pay-ins, pay-outs, safe deposits, and transfers between virtual and physical tills. This guide is designed to help users configure and manage their tills and use the Management Console’s reporting capability to keep track of the cash moving in and out of their tills. First, log into your Management Console, and navigate to the Settings page. Click Clear Selections next to the menu on the left hand side, and search for the word tills in the search bar above the menu. Barcode Safe Drop amount on receipt: Encodes the currency and amount of the safe drop into a CODE128 barcode and prints it on the safe drop receipt. Print Cashier Receipt for Safe Drops: Prints a receipt for the cashier in addition to the safe drop receipt. Track Coins in Tills: When this is enabled, your till will track coins as well as paper monies. Corresponding coin fields for each denomination will be on the Till Management window when checking out a till on the POS. You need to indicate the values of the coins you accept, and enter the default value of coins (ex. .05, .10, .25 to indicate the coin values). Require Setting of Tills: This will require anyone with access to a till to set it. Require Till Closure Before Clockout: If enabled, this will require an employee to close their till and do a safe drop before clocking out. This will reset the till back to the original starting amount for another employee to login, or for you to take the till out of the cash drawer and put it in the safe at the end of the business day. Note: Virtual tills do not have the same restrictions as physical tills, as they are representative of the cash in an employees pocket. Require Envelope Number: When enabled, this will require an envelope number to be entered on every safe drop on the POS. Full Foreign Currency Tracking: By default, Revel translates all foreign currency and tracks it by the base currency. Enable this box if you want to track the payment in the currency it was made in and only translate into the base currency for reporting purposes. Note: Revel assumes that any coin currency is given in the base currency. Till Alert: You can create an alert to force a safe drop when a till reaches a certain amount of money over the base amount set at clock in. Once the alert amount is set, you can set the till to deny transactions until the safe drop is completed, send an alert email to a manager, show a warning to the employee that the till is at the set amount, and even set an alert at an interval or have an alert show after each sale. Offline Till Management: When this is enabled, you can use the Tills Report to close tills and perform minor edits. Your changes will be tracked in the Action Log. 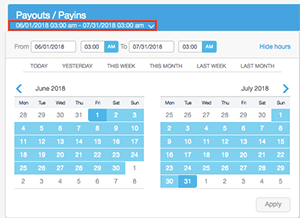 When you enable the End of Day Process from the Management Console, employees will be required to complete a set of tasks that you set before they can clock out. 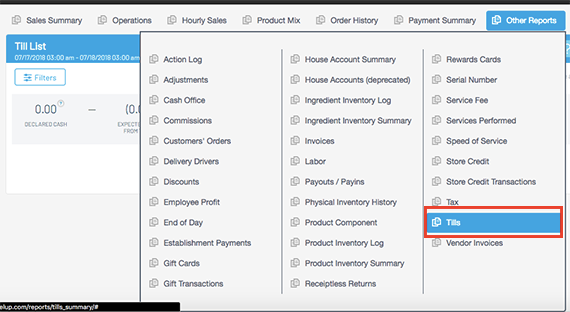 This helps ensure consistency between till management and employee logins and logouts. The End of Day wizard has a step that allows employees or managers to close all open or held tills before closing down for the day. You can learn how to set up and manage your End-of-Day process in our article End-of-Day Process. Note: All child POS stations must be linked to a parent station for this function to work properly. Tills are enabled for employees through role permissions, which can be found on the Employees > Role Permissions page. They have been divided into eleven different role permissions by functionality. Owners and Managers can use these permissions to customize the level of access each employee gets to the till management system of the POS. If you're looking for general permissions for employees, take a look at our article Setting Up Administrator Permissions. Note: These settings are edited within the individual employee role permissions. See our article Role Permissions Guide. Access All Tills: This setting allows an employee to bypass the till ownership restrictions. Allow Cash Entry Correction: If this permission is disabled, the back button on the Till Checkout Summary pop-up screen will be disabled for that employee. Assign Till Ownership: Allows the employee to modify ownership of a till. For example, a manager can set a till and then assign it to a cashier. Bank Drop: This allows the employee to perform Safe Drops without using a password. Cash Logs: If this permission is disabled, employees are prevented from printing cash logs from the Set Till and Till Management screens. Checkout Summary: If this permission is disabled, the Checkout Summary pop-up screen is suppressed for the employee. Close a Till: If this permission is disabled, the Checkout button on the Set Till Amounts screen will be disabled for the employee and they will not be able to close the till. Hold a Till: If this permission is disabled, the Hold Till button on the Set Till Amounts screen will be disabled for that employee. Pay-Ins: When enabled, this allows the employee to perform Pay-Ins without a password. 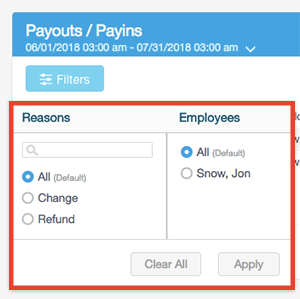 Pay-Outs: This allows the employee to perform Pay-Outs without a password. Set a Till: Allows an employee to set a till. Certain combinations of role permissions can be combind for various types of till configurations. For security purposes, you can configure Blind or Semi-Blind Tills to prevent employees from altering the amount of money reported in the till. Blind Till: A Blind Till is configured by disabling the Checkout Summary and Cash Logpermissions, and the Safe Drop feature. Tills can be set at the beginning of the employees shift, but once the Checkout button is tapped, the POS closes the till without prompting for a Checkout Summary. The employee will have no knowledge of what the expected amount is in the till. Semi-Blind Till: A Semi-Blind Till is configured by disabling the Cash Log and Allow Cash Entry Correction permissions, and enabling the Checkout Summary permission. The employee can see the final over/under, but cannot change the final value. The employee can also print out a short receipt (chit) with the final payout to perform with safe drops. Click one of the links above to see the details of each report and what it is used for when managing your tills. The Tills Report displays information about the tills that have been set on the POS. This report is found by hovering over the Other Reports link in the reporting home page, and select Tills from the menu that appears. Declared Cash: This is the sum total of cash from all tills. Expected Cash From Tills: The sum total of cash operations including starting cash, payments, payins, payouts, and safe drops. Other: This is the sum of all cash operations not linked to a till. Variance: This is the total declared cash less all cash operations. Positive numbers mean a cash overage, negative numbers means less cash than expected. Note: If you've enabled and configured currencies in addition to U.S. Dollars, these currencies will display in this section. Within this report, the Safe Drop report tab reflects safe drops made by employees from their assigned till. As shown in the image above, expanding a Safe Drop entry on the report displays the following information about the till that performed that action. Safe Drop # — Indicates the cash drawer the till is connected to. Station Name — The ID number of the till. Date Dropped — The amount of money in the safe that was confirmed by an employee. Variance — Any difference between the Declared Amount and the Confirmed Amount. Date: The first section of the report will provide the date and time that the pay-out or pay9n was completed. Employee: The employee who performed the pay-out or pay-in. Drawer/Virtual Till Owner: The cash drawer number that the till is connected to, or the owner of the virtual till if set up. Station: The POS station the till is configured on. Reason: The reason for the pay-out or pay-in. Amount: The amount of the pay-out or pay-in. Negative amounts indicate a pay-out and a positive amount indicates a pay-in. Starting Cash: The aggregate cash that was set on all tills across all POS stations. Cash Payments: The aggregate cash that was set on all tills across all POS stations. Pay Ins: Total amount of money from all pay-ins performed by tills across all POS stations. Pay Outs: Total amount of money from all pay-outs performed by tills across all POS stations. Safe Drops: Total amount of money from all safe drops performed by tills across all POS stations. Expected Cash (till count): Based on the fields described above, the expect cash in all tills across all POS stations. Actual Cash (final till count): The actual, employee counted cash in all tills across all POS stations. Expected total cash to business: Based on the fields described above, the expect cash in all tills across all POS stations. Actual total cash to business: The actual, employee counted cash in all tills across all POS stations. Now that we've learned all about Tills in the Management Console, let's take a look at how to manage them from the POS! Check out our article, Using Tills on the POS.